This article was originally published on Houzz on Aug. 15, 2013, as "Championing the Solar House, From the 1930s to Today," and is presented here with permission. Read the original article. According to author and educator Anthony Denzer, a solar house—one that deliberately uses the energy of the sun for heating spaces—is often thought of as a product of the 1970s: "An eccentrically shaped structure with oversized sloped glass walls and diagonal cedar siding...an earth berm...a Volkswagen van nearby." He admits that this image isn't completely false, since many architects tackled house designs in that period that would minimize the use of fossil fuels, spurred by the oil and economic crises. But it's an incomplete picture. Denzer's The Solar House (Rizzoli, 2013) corrects this oversight by tracing the development of solar houses from the 1930s to today. It's a narrow topic, but the book is a fascinating, accessible read. Denzer has crafted a narrative of the architects and engineers who devoted much of their lives to searching for houses that would use less energy, as societal and political currents ebbed and flowed with and against them. A general story of solar houses could be painted as the conflicting attitudes of two fields: the architects' aesthetic and interest in passive heating versus the engineers' technological and active (mechanistic) focus. This is an area that Denzer spends some time on, and it is an especially important one, considering that we have not reached a reconciliation that might enable more widespread appreciation of solar houses. This is not to say the story is about a duel of two groups. But it is indicative of wider strands in American society—particularly concerns of how things look and how things perform. The Solar House, original photo on Houzz. Denzer starts the book with Fred Keck, described as the first solar architect. Keck worked with his brother William in the firm Keck + Keck, designing a number of residences in and around Chicago. Many of them focused on the development of the solar house as a unique type. The characteristics they share are linear east-west plans with large, south-facing windows and roof overhangs to block the high summer sun. 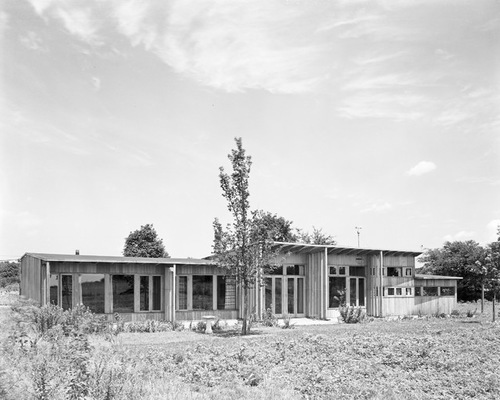 Howard Sloan commissioned Fred to design a prototype solar house in the North Shore Chicago suburb of Glenview in 1940. Sloan opened the house to the public, charging a dime admission to more than 5,000 visitors in four months. He hoped that the comfortable interior on cold winter days would persuade people of the merits of solar houses. Keck would continue to work for Sloan, incorporating new materials and technologies (triple-pane glazing to reduce heat loss from inside to outside at night, radiant heating, etc.) in a 24-house subdivision they called Solar Park. 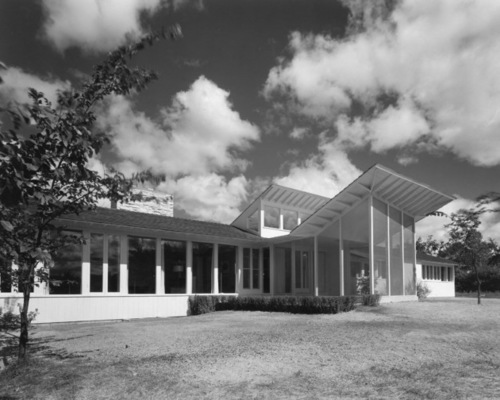 Keck had also developed operable and insulated louvers that were often below the south-facing glass; these assemblies allowed for ventilation during the day while helping to maintain the interior temperature at night when closed. Pictured is the Duncan House in another Chicago suburb, Flossmoor. It included the same elements (linear plan, south-facing windows, roof overhangs) but also exterior "wing walls" with adjustable vertical louvers for cutting down on the late-afternoon sun in the months when overheating of the interior occurred. The Keck brothers weren't really known for the solar houses they developed in the 1940s (they were omitted from Sigfried Giedion's influential Space, Time and Architecture even though he toured their houses). Instead it was a couple of houses Fred Keck designed for the 1933 Century of Progress fair in Chicago, both glass houses rather than solar. The House of Tomorrow and Crystal House both featured all-glass exterior walls with blinds and curtains, respectively, for shading. The houses were extremely popular, but their intent and appeal were formal rather than functional; they pointed to an alternative future through the use of glass. But Keck did realize the benefits of solar heating, which led him to develop houses in the next decade with more selective glazing. With so much single-pane glass, the House of Tomorrow would overheat during the day and lose heat at night, something that did not discourage Mies van der Rohe and Philip Johnson from creating inefficient glass houses almost 20 years later. The solar houses that pepper Denzer's book therefore resemble the 1970s stereotype, rather than glass houses, but they are the 1970s typology in the making. There is a Frank Lloyd Wright "hemicycle" house, a similar but inverted curved house by the Keck brothers, amid work by less-known architects who created houses within academic institutions or for companies that would benefit from the implementation of solar houses. In the latter vein, Libby-Owens-Ford commissioned notable architects to design solar houses for each of the 48 states at the time; in the end only a book of the designs was produced, not the actual houses, but the initial hopes were high. Architect Henry Wright's renovation of the Ramirez House in Pennsylvania employs the same principles as the Kecks' pioneering work. But its wood floor did not allow for the sun's energy to be stored and released later, as happens in concrete floors. From discussions of the house came a focus on thermal mass as an important part of solar houses. 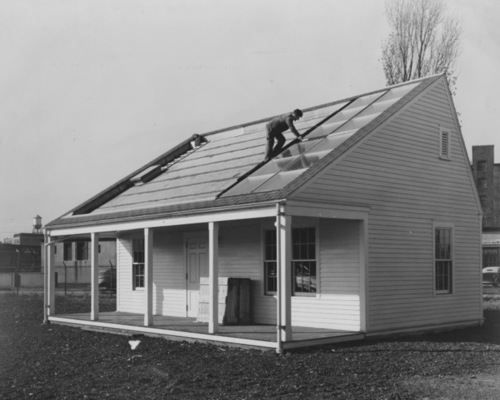 Many schools worked on developing solar house designs, particularly MIT, with its numbered series of house designs starting in 1939. As can be seen here, Solar House I, developed by engineer Hoyt Hottel, focused on technology over architecture. The south-facing roof was covered in flat-plate collectors, or heat traps, which Denzer defines as "a shallow box, consisting of three glass places separated by airspace, a black-painted copper plate backed by copper tubes of water, and 5 1/2 inches of mineral wool insulation." The sun would heat the plates and therefore the water, actively heating the spaces through mechanical means. Maria Telkes, an engineer at MIT who developed an alternative scheme to Hottel's, worked with architect Eleanor Raymond on a house with a similar reliance on technology but one whose form and aesthetics would also benefit the design. The Dover Sun House positioned Telkes' collectors (made with phase-change salt in containers behind glass) above south-facing windows, so the occupants would have views and the sun's heat would be stored to heat the interior via bins above the ceiling. 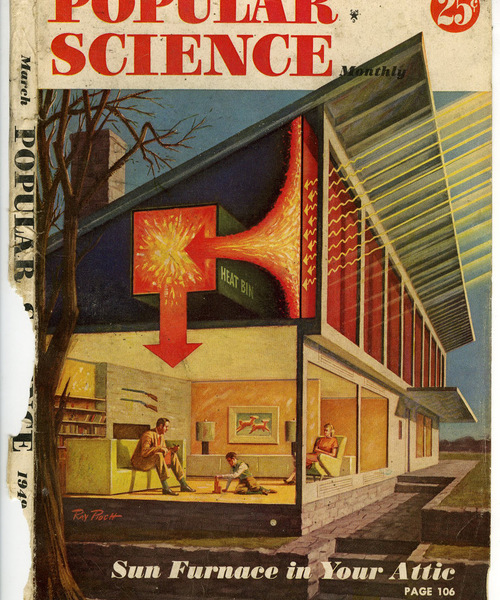 A testament to the popularity of the Dover Sun House, as well as the desire for houses that would use less energy in the postwar years, can be seen in a cover story of Popular Science in 1949. Unfortunately, the system lasted only two years, due to the sedimentation of the solid and liquid salt and the corrosive effects of the element on the bins. The efforts on the part of engineers and architects developing solar houses in the years before and after World War II culminated in the 1955 World Symposium on Applied Solar Energy and the 1957 Solar Energy exhibition in Greece. So many solar houses were built after 1955 that, as Denzer says, "documentation would be impossible," but it was not enough to stave off the low cost of energy and the rise of air conditioning in those years. Nevertheless, Denzer presents some novel projects from these years, such as engineer Masanosuke Yanagimachi's Solar House II in Tokyo. The interior looks like that of a traditional Japanese house, with tatami mats and translucent panels, but it also includes radiant ceiling panelsserved by rooftop heat traps, as in Hottel's MIT prototype. Yanagimachi's Solar House II is one of the many projects documented in the book with architectural drawings. 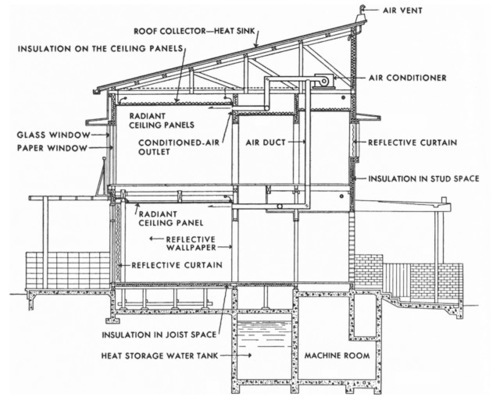 This building section illustrates how the systems are tied together, from the rooftop heat sink and radiant ceiling panels to the innovative heat storage water tank in the basement. The latter was used for both heating and cooling; in the case of cooling, the heat pump made ice at night that was used the next day to cool the water pumped through the house. The concept of off-peak ice storage is now increasingly common in green buildings, even in skyscrapers. Denzer calls the late 1970s a "Solar Renaissance," suitable given that even Jimmy Carter mounted solar hot-water panels atop the White House in 1979 (to be removed by Ronald Reagan seven years later). 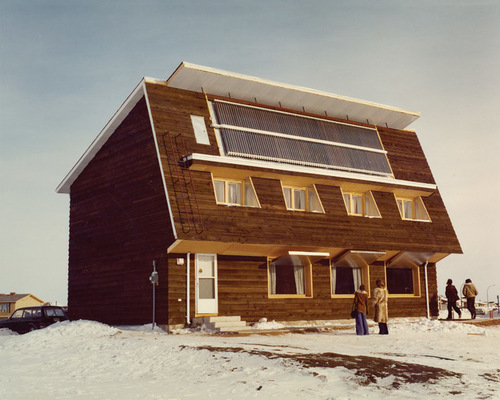 One of the projects from this time period is Saskatchewan Conservation House, which resembles early solar houses in form but departs from them in important ways: It has smaller and fewer windows, it doesn't rely on most of the engineered technologies from the previous decades, and it is superinsulated. The latter attribute is its most lasting, influencing today's Passivhaus principles and Canada's R-2000 program. The basic idea of the superinsulated and supertight house is that the heat within the interiors (some of it coming from solar gain) isn't lost to the outside. Fresh air is brought in by an air-to-air heat exchanger, as is the case in the Conservation House. The house performed so well—reaching what would now be referred to as net-zero status—that the solar collectors mounted above the second-floor windows could have been omitted, as they weren't needed for space heating. Denzer ends the book with some snapshots of solar houses today. 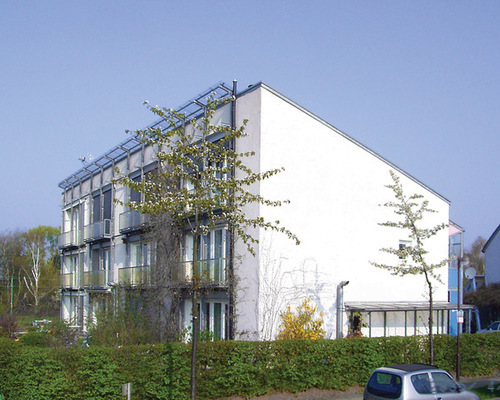 These fall into the superinsulated camp of houses designed to Passivhaus principles, like this 1991 house in Germany by Wolfgang Feist and others, and the biennial Solar Decathlon competitions, in which student teams design and build houses that vie to be the greenest in a number of measured ways. The latter more closely resemble the pioneering work of the Kecks, but the work in the competitions also attempts to synthesize architectural and engineering considerations, arising through multidisciplinary teams and integrated design. 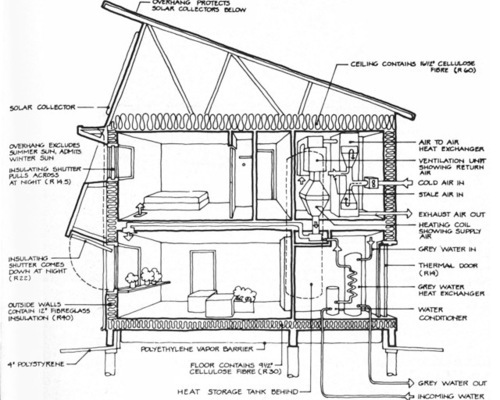 It's clear from Denzer's book that there is more to solar houses than previously understood or imagined. But it's also clear that there is still plenty of work that needs to be done to synthesize the aesthetic and the technological, and to persuade the public that solar houses are viable and desirable. Rising energy prices may make solar houses more desirable in the years and decades to come, so it's time for architects and engineers to work together on creating solutions that tap into those Denzer so eloquently presents.